Born in Noël Mina, Timor, in 1925, she taught English and was also an interpreter. In addition, she was a journalist and worked for Radio Gelora Pemuda Indonesia. In the Netherlands she was a member of the board of the Dutch Indonesia Comittee, as well as co-founder and member of the Stichting Azië Studies [Foundation Asian Studies]. Francisca is the daughter of Gottlieb Fanggidaej, a civil servant in the Netherlands Indies administration, and Magda Maël, a homemaker from Timor. In 1948 Francisca married Sukarno, a board member of the Pemuda Sosialis Indonesia (Pesindo; Indonesian Socialist Youth). A second marriage to the journalist Soepriyo resulted in six children. She went to the Europeesche Lagere School [European primary school] and to the MULO (initial secondary school). At home she was only allowed to speak Dutch. Following the Second World War Francisca was active in the Indonesian struggle for independence. In 1945 she became a member of the Pesindo. After the Pesindo congress of 1950, the organization became firmly affiliated to the PKI [Indonesian Communist Party] and changed its name to Pemuda Rakyat. She became chairwoman of the Pemuda Rakyat. In 1947 Francisca traveled as a delegate of Pesindo to Europe to participate in several meetings and conferences. She also began her career as a journalist, which allowed her to travel throughout the world. 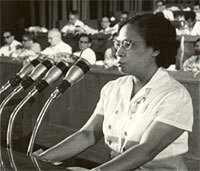 In 1957 Francisca was a representative of the journalists to the Dewan Perwakilan Rakyat [Indonesian People's Congress]. As a delegate of the Indonesian parliament, she visited Cuba in 1960 and 1963, and met Fidel Castro there. In 1964 she became an advisor to President Sukarno during his state visit to Algeria. In 1965 she was a member of the Indonesian delegation to a congress of the International Journalist Organization in Chile. During this trip there was a coup d'état in Indonesia, which prevented her from returning to her native land. She then lived in exile in China for twenty years. Since 1985 she has made her home in the Netherlands. In 2003 she was able to return to Indonesia, after nearly forty years of exile, to see her family.